The tip of a soldering iron does not get properly heated when it’s covered in deposits that accumulate if you don’t clean it regularly. During heating, dirt on a soldering iron is typical of visible brown deposits on the tip. This is an important tool – cleaning not only maintains it, it also ensures its durability. Soldering irons come in different sizes that determine the multitude of tasks it can perform. Maintaining it requires a lot of care before, during and even after use to increase its efficiency and longevity. 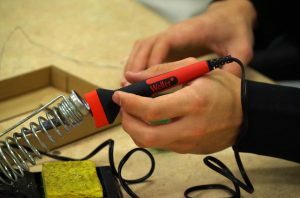 How to clean a soldering iron majorly depends on the soldering process you use. Clean the tip after every use, but always allow the soldering gun to cool first before cleaning. Oxidation can take place on the tip when it’s not cleaned properly, hence exposing the copper underneath the iron coating. With a wet sponge, wipe off the tip once it cools. The tip can burn your bare hands while cleaning if you don’t let it cool properly. Slowly rub the tip of the soldering iron onto the sponge and wipe it clean. Depending on what is available, use steel wool to scrape off the rust, coloring and stains on the tip. Although it is a personal decision to wet the steel with water, ensure that there’s no water drops on the soldering iron’s electric surface. Scrub the tip lightly to minimize wear on the iron plating. Use sand paper to scurf the rusty surface off, but do not overdo it since you are not trying to remove the tip of the metal completely. Buy sand paper with about 220 to 400 grit for the finest grade. The sand paper can also be used with water to clean the soldering tip for the next reuse. In order to use steel wool or any other abrasive cleaner such as sand paper to clean the tip, it is advisable to purchase a solder that has high content of tin and overall good quality. Cleaning is the primary care method most soldering experts recommend for proper maintenance of soldering guns and irons. The maintenance process is not complete without ‘tinning’ your soldering kit. It is also important to tin the tip of the soldering iron after cleaning and repeat the process periodically. Tinning is putting a small and light layer of solder over another metal piece. This helps the tip of a soldering iron to conduct heat quickly, hence minimizing heat damages. The tinning procedure is also done to reduce the rate at which oxidation takes place thus, preventing rust from accumulating on the tip of the soldering iron. 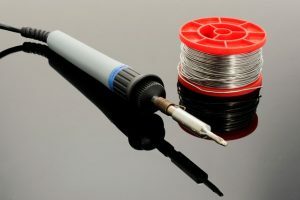 Most soldering experts have always recommended low heat to be used for tinning since minimal temperature ensures fast use. 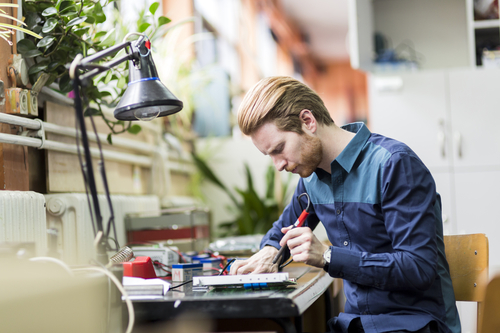 With low heat, it also takes a soldering iron a short time to cool after use. Contact us today to find out more information about how to tin a soldering iron.